If you are still looking to become a published writer, Jamie is proof that there is still a chance for anyone to become published. Jamie didn't win the Times/Chicken House writing competition this year, but he was shortlisted and Chicken House still wanted to publish his work. It's quite common that they do this, so don't give up, there is still a chance you will get your publishing deal. Jamie says "over half of those shortlisted have been published since – an impressive statistic. There are over a thousand entries a year, but if you’ve got the story for it, I cannot recommend entering enough." 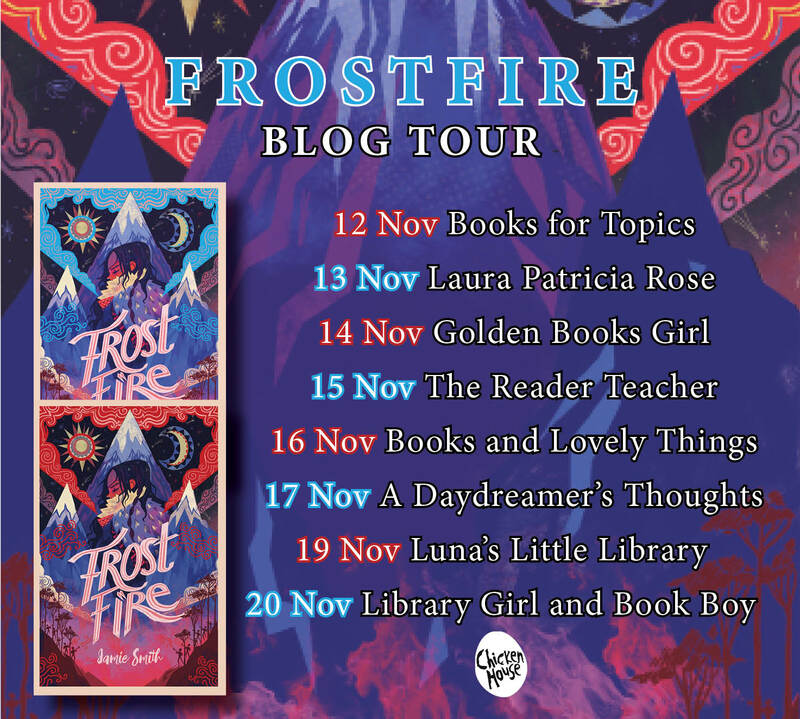 Today I am part of the blog tour for Jamie's entry which is Frostfire and I have my review to share with you of this fantastical adventure story. Sabira has been chosen. Chosen to bond with a Frostsliver, a part of the glacier that looms over her and her village. As she embarks on her already dangerous pilgrimage to find her frostsliver, there is even more danger and peril than she first realised. Tested to her uppermost limits, Sabira must get back to her village. With danger at every turn in this unforgiving, freezing climate, you worry that our heroine won’t possibly make it out alive. Despite all the perils she faces though, it doesn’t seem like anything will knock her resolve, she must get back to her people. This was a fantastical icy adventure with danger at every corner. Our heroine Sabira is not only physically tested but mentally too. Her determination and resolve really shone through and I would like to think that in a situation like that I would find strength just like Sabira. 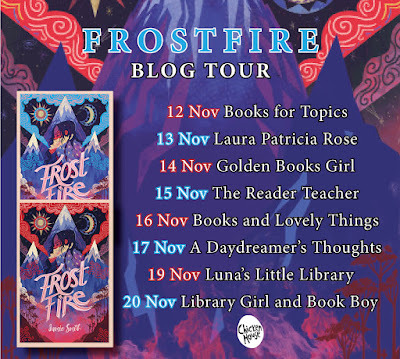 Helped by a trusty frostsliver along the way, this really helped give the story it's fantastical edge and was one of my favourite parts of Frostfire. The place setting really came alive whilst reading. The glacier may be beautiful but it is such a hostile environment. Anything could happen at any point, plus throw in some fantastical creatures and an army set to destroy Sabira's people and it is not somewhere you would want to spend long. I didn't see how this story was going to be wrapped up in time, but it was and it left you feeling satisfied with the ending. An icy adventure that is great to curl up with on a cold winter evening.